I am so excited to be sharing my small space redecoration in partnership with Urban Outfitters! I remember falling in love with UO Home decor late in high school when I first began dreaming of having a college dorm to decorate. Scouring the Urban Outfitters website is honestly one of my biggest sources of inspiration when it comes to developing an aesthetic and color scheme for my room, even when I’m creating DIY decor or purchasing similar items. (I actually got so distracted on the UO website linking items for this post!!) Getting the chance to make my small space in NYC extra cozy with UO Home was a dream come true! It’s no secret that living in New York City means dealing with a very small amount of square footage. 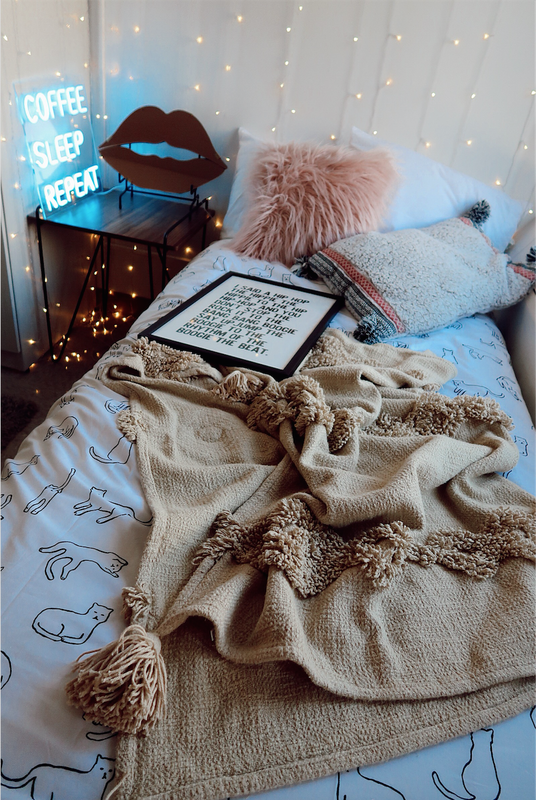 Because of this, I wanted to create a space for myself that is extra cozy- that means mood lighting, perfect bedding, and lots of texture. I absolutely love incorporating prints, fun quotes, and lots of pillows into my room decor each year! I was careful to select versatile items that can easily transition into an apartment setting when I graduate in the spring. I got a few questions about specific items in my room, so I’m linking everything below! Fleece Lumbar Pillow. This pillow is actually the coziest- so soft and the perfect cuddle size. I’m obsessed with being surrounded by pillows at night, so it’s the perfect addition to my bedding! Coffee, Sleep Repeat Sign. I absolutely looooooove this sign. It’s the perfect amount of neon mood lighting and would be SO cute in a little kitchen coffee bar. Tufted Throw Blanket. This blanket is so soft and comfy! It’s the perfect weight and keeps me extra warm now that the autumn nights are cooling down in NYC. Lips Mirror. This mirror has been on my wishlist for the longest time. From the rose gold tint to the cuteness of the lip shape, I had to have it. It’s actual meant to hang but I didn’t trust my command hooks, so got a cute stand for it on Amazon.com. Cat Nap Duvet. Since I can’t have an actual cat yet, this bedding is the next best thing. I also love the fact that it’s named the “cat nap duvet.” Makes napping that much better. Honeymoon Hotel Art. I’m OBSESSED with this print!! My best friend Nina know’s every. single. word. to the song “Rapper’s Delight” and these lyrics remind me of her every time I glance at the art work. I miss her so much all the way across the country in Seattle so I love how this artwork takes me back to all our carpool karaoke sessions. Loft Side Table. This table is actual perfection. The perfect shade of brown, I can’t wait to arrange it next to a cozy couch this summer. A huge thanks to Urban Outfitters in partnership on this post.